Anglo Indian women were the unsung heroines of our Community. While the male heads of households were involved in their careers, it was their women-folk who took on the tasks of rearing families with gentle (or sometimes not so gentle!) discipline, instilling home-grown principles of honesty, diligence and respect for elders. They honoured Christian beliefs and true-blue Anglo-Indian traditions. As these stories reveal, many were widowed at a young age with meagre financial resources; most had growing families to support, and their courage and determination in the face of tragedy makes for extraordinary reading. The contributors to this collection of essays pay tribute, sometimes with wry humour and at other times with deeply felt emotion, to the women who shaped their childhood years. Every reader will find parallels to their own personal 'heroines' - mothers, sisters, aunts and last, but far from least, those school teachers whose values have enriched their lives. Publisher Blair Williams says in his foreword: This book provides insight and balance into the reality of the Women of Anglo-India. We have captured not only who she was but how she lived. We have captured her as a mother, a wife, a sister, a girl friend and as a person in her own right. Many scholars have stated that the Anglo-Indian woman was the bedrock of the community, in many cases having to be the bread winner and the home builder. This book series has another important and synergistic function. It funds CTR, a USA registered 'Not for Profit' charity, established in 1999, to help destitute Anglo-Indians in India - by providing seniors with a monthly pension and supporting children's education. The gross sales proceeds of all CTR books goes to the charity (publishing costs are privately borne). In my preface to Voices on the Verandah (2004) I wrote "I believe that we, the sixty-something generation of Anglo-Indians, have a unique opportunity to contribute to the dual purpose of this endeavor. Join me in influencing, perhaps creating, history. We can and will make a difference". I believe we have and will continue to do so. The author recounts the life of her great grandmother Mary Ann Leonard (1860-1937) widowed at the age of thirty and who made a living in Bombay by supplying tiffin lunches to British and AI men working at Victoria Terminus. She represented one aspect of AI culture, which compelled women to work for a living due to difficult life circumstances. The latter part of the story is about the author's mother Babette. The numerous descriptions of the foods prepared in the kitchens of these two women would fill a recipe book that one would want to buy. The author attempts to recapture the life of her mother by visiting the towns of Kalimpong, Darjeeling and Siliguri. She discovers again the excitement of a big city like Calcutta where her mother developed her sporting prowess that led her to excel in hockey and basketball as a young woman. The story captures the reader's imagination and takes one back to a different place and time. 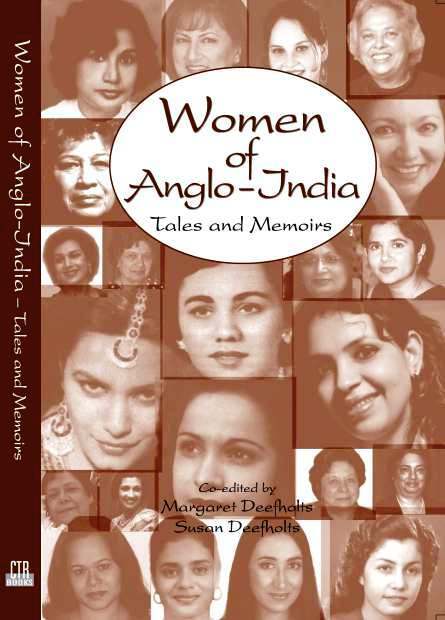 Using a generic version of what an AI woman stands for and represents, the author attempts to cover all aspects of Anglo-Indian culture in colonial days until "along came Ghandhiji and Indian Independence in 1947 when her world changed and she was literally caught between India and England and felt she belonged in neither country." The author successfully captures the Indian side of her heritage through retrospect and flashback while transporting the reader through a time frame spanning several decades by the turning of the wheel. The observations of the author after meeting a group of Anglo-Indian women ranging in age from 45 to 85 in the outskirts of London, are detailed under sub headings: appearance, dress, speech and writing, food habits, education and professions, marriage and family life, child rearing and lifestyle. The author remarks that although they've embraced English mores in an attempt to blend with their Anglo Saxon counterparts, for the most part, the metamorphosis is superficial. Unlike other articles in the book that are written mostly about women mentors, the author describes, with a keen sense of observation, her own realization of her AI identity as a young woman growing up in Canada. This speaks of the grandmothers, mother, sister and daughter who have been the corner stone of hearth and home, who inspired by example and sustained homespun family values. The article covers the impact that these women have had on the author's life and it dramatizes the inner and outer landscapes of the characters themselves.